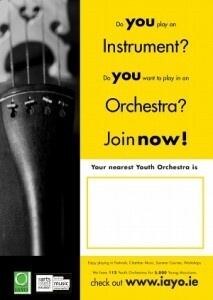 Click here to download a poster to advertise your orchestra. The poster is A3 sized but can also be printed to A4. Any printers should be able to produce the poster printed to the edge for less than €1 a copy. IAYO can provide a copy with your orchestra details ready to print. Contact the office for more details.